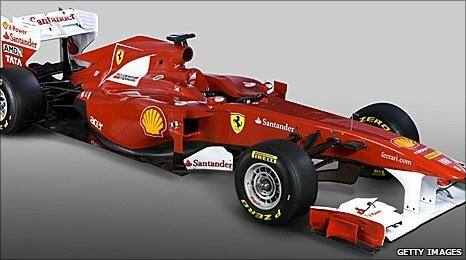 Ferrari have become the first team to show off their 2011 car with the F150’s unveiling earlier today. The car keeps the nice white front and rear wings and details that the F10 had which I really liked. Otherwise, in terms of shape and livery it looks very similar to its predecessor. Obviously it now looks more italian than ever with the new Italian flag on the back of the rear wing, as well as the new Scuderia Ferrari logo on the engine cover replacing the ugly Marlboro barcode. The Pirelli tyres also add to the extra Italian feel and the yellow accent on those tyres look great on this car. Especially if they have colour coded red tyres as well. Other small changes include a Ferrari.com logo on the side of the nose, a logo on the top of the nose for Kaspersky internet security, which seems a bit of a strange sponsor. A more intricate design on the barge board where there used to be a plain flag is the only other change that I can see. Overall, it’s hard to get a handle on the actual look of the car yet apart from the livery because Ferrari have stated that the car will evolve a substantial amount over the testing period leading up to the first race. In terms of which cars I’m most looking forward to seeing in the coming days, I would put Team Lotus, Virgin and Hispania at the top of the list, as they have the most that can be improved upon. Unfortunately we won’t see the HRT car for a while as they’re developing until the last test in Bahrain before they run it. The Lotus team have not hidden the fact that last year’s car was conservatively designed, intended to just finish races. This time, I look forward to seeing a radically different car. Renault and Williams have both made statements about their cars being very aggressively designed while McLaren have indicated that they have something special up their sleeves, and this is from the team who pioneered the F-Duct so you know that they have the capacity to innovate. Mercedes haven’t been talking much about their car but that’s probably a positive thing and shows that they are fully focused on the task at hand. Brawn GP took their eye off the ball at the end of 2009 while winning the championship and hooking up with Mercedes. It cost them dearly with their 2010 car. Now they have stability with a big financial backer and because they have spent a lot of last season developing this year’s car early, I think they will more than make up for the mistakes of the previous car. Red Bull and Toro Rosso I don’t expect big changes from. Red Bull’s car will be another iteration and I don’t see how Toro Rosso can move up the grid further because I have no doubt that Sauber, Williams and Force India will be ahead of them. Team Lotus I think will pass them quite soon as well if they are putting as much investment into the team as it appears. I think HRT might end up being flat-out dangerous if their car isn’t any faster than last year. If they also don’t use the KERS unit which it seems as if they won’t, the speed differences between leaders and these cars being lapped will be ridiculous and definitely dangerous. We saw the danger last year at Valencia with Mark Webber caught out by the Lotus’s early braking point. This year could be much worse. In a perfect world, everyone would have equally competitive cars and the racing would be amazing. Unfortunately with F1 the way it is, it’s practically impossible unless something changes. More thoughts on the new cars coming soon.